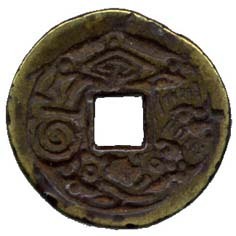 In China, charms are known as "Yen Sheng Ch'ien" or "Yan Sheng Zhu" , other more popular names for charm are "Hua Chien" [flower coin] or "Wan Chien" [play coin]. They were used as amulet against evil and not as money, so that the Chinese collectors seldom collect them. Personally, I don't intend to collect Hua Chien, but I still get some charms. It is because a few years ago, I had chance to collect coins directly from the hawkers. They sold coins to me in strings of 300 or 500 pieces of copper cash, which were occasionally mixed up with one or two charms. It is very difficult to trace the history and developments of Hua Chien, but the mintage of Hua Chien began as early as the Han Dynasty. Actually, those we can see were cast during the recent 100 years. That type of coins normally bear auspicious characters on the obverse side. On the reverse side were various designs of double fish, dragon and phoenix, stars, sword, tortoise and snakes, etc. Hua Chien is only used as an ornament or an amulet to expel or keep away evil spirits and unpropitious influences and not as money. On the other hand, the ancient coins were often use as charms in times past. I find that this pratice is still very common even nowadays. In 1860s, Mr. R. J. Doolittle mentioned about the use of the ancient coins in his book "Social Life of The Chinese". He wrote : Ancient coins are in frequent use as charms, suspended by a red string, and worn about the body, or hung up on the outside of a bed-curtain. They are sometimes tied on the wrists of Children soon after birth, and worn for several months. 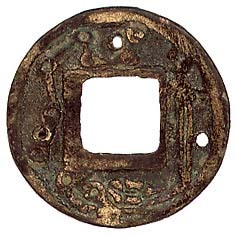 Under the bed used by a newly-married couple several sets of five coins of five different emperors are often placed. [It is known as "Wu-Wang-Chien" . 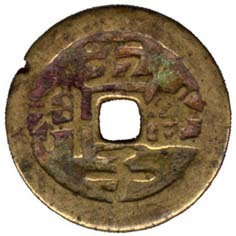 Copper cash of Qing Dynasty are often used including Shun-chih; K'ang-hsi; Yung-cheng; Ch'ien-lung and Chia-ch'ing T'ung Pao.] Sometimes five such coins are put under the door-sill, and other five are also placed under the kitchen furnace when built. The object of all this is to secure good luck to the builder or the family inhabiting the house. The legends of this coin is written in seal script and the size of this coin is much small than a normal "Ta Ch'uan Wu Shih" coin which normally was cast by Wang Mang during 7AD to 23AD. On the reverse side are the inscriptions of stars, sword, tortoise and snake. This is a typical Chinese charm. There are four holes appeared on the coin, from them we know that this coin had been sewn on the headdress of child in order to keep away from evil influences during ancient time. Stars represent the inexhaustable source of pardon and love. Sword represents wisdom, penetrating insight, victory over evil, superhuman power, emblem of sage. Tortoise represents longevity, strength, endurance. Tortoise is normally regarded as a messenger to the human race. Snake represents cunning, evil, and supernatural power. I am surprised that snake is chosen as one of the good symbols. 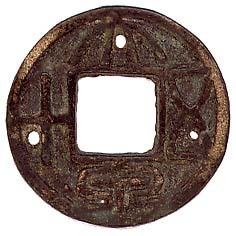 A genuine "Wu Hsing Ta Pu" coin was cast in the 3rd year of the Kien Te reign of Emperor Wu of Northern Zhou [or Chou] (574AD). 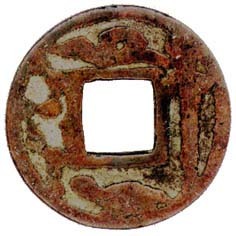 This coin is a charm, I think this charm was cast in the period between the later Ming Dynasty and the early Qing Dynasty, by judging from its style and color. 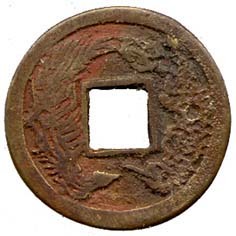 On the reverse side are the inscriptions of stars, sword, tortoise and snake, similarly to the upper coin. 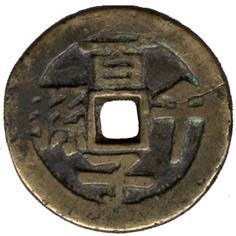 The inscriptions on the obverse of this coin are four Chinese characters "Cheng Te T'ung Pao" and the dragon and phoenix designs are inscribed on the reverse. This is a favourite amulet for Chinese sailors. 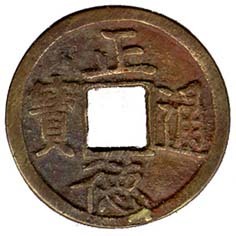 "Cheng Te" coins are regarded as able to keep off evil spirits of sea or river. 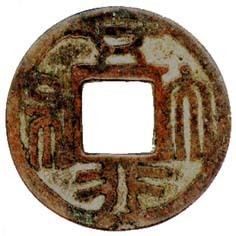 There is no any reference about the Ming emperor Wu Tsung [Reign of Cheng Te Period 1521AD-1567AD] had cast coin. This coin is a recent imitation only. [The dragon represents royalty, rain, spring, and dragon admonishes against greed and avarice. The phoenix is the bird fabled to burn itself on a pyre and rise renewed from the ashes. In china, phoenix is known as "Feng-Huang" . "Feng" is the male phoenix and "Huang" is the female phoenix. The phoenix represents the Empress, beauty, warmth, prosperity and peace. Ancient Chinese believed that dragon presides over the Eastern Quadrant of China and the phoenix ruled the Southern Quadrant of China.] The eastern and southern parts of China are four different seas of China. 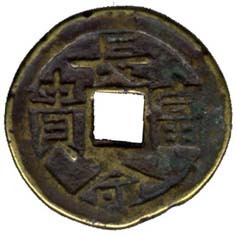 On the obverse of this coin, four Chinese characters are "Chuang-Yuan Chi-Ti" and on the reverse are four Chinese characters "Wu-Tzu Teng-K'o" "Chuang Yuan" is the highest graduate of the Hanlin Academy. "Chi Ti" means passing an examination. "Wu Tzu" means five sons and "Teng K'o" means be successful in the examination. "Chuang Yuan Chi Ti" means a member of your family gets the hightest graduate in the Hanlin Academic Examination. "Wu Tzu Teng K'o" your five sons are great successful in the imperial examinations. Tien Shih (Palace examination or the Hanlin Academic Examination). Chieh-yuan: No.1 graduated in the provincial examination. Hui-yuan: No.1 graduated in the metropolitan examination. Chuang-yuan: No.1 graduated in the Palace examination. 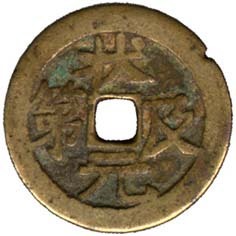 On the obverse of this coin the four Chinese characters are "Pai-Tzu Chien-Sun" and on the reverse are four Chinese characters "Fu-Shou K'ang-Ning". "Pai Tzu Chien Sun" is a very popular and felicitous phrase which means a hundred sons and a thousand grandsons. "Fu-Shou" means prosperity and longevity. "K'ang-Ning" means in good health. 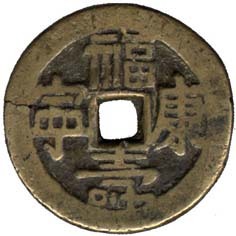 On the obverse of this coin are four Chinese characters "Chang-Min Fu-Kuei" "Chang-Min" means long-life and "Fu-Kuei" means wealth and honour-a felicitous wish. On the reverse of this coin are designs of four treasures or antiques, they are "Fang-Sheng [lozenges], Wo-Ts'an [silk worm], Hsi-Chueh [horn cups] and Huo-Chu [fire pearl]"
Fang-Sheng : The lozenges represent victory, they were used to ornament the headdress as a symbol of victory in ancient times. Wo-Ts'an : The silk worm was an emblem of industry in the past. Hsi-Chueh : The rhinoceros horn cups represent happiness. Huo-Chu : The flaming pearl symbolizes pure intentions and genius in obscurity. W. F. Mayers : Chinese Government, Kelly & Walsh Ltd., Kegan paul, Trench, Trubner & Co., Ltd., 1897. R. J. Doolittle : Social Life of The Chinese, published by Harper & Brothers, Publishers, Franklin Square 1865. Ting Fu Pao ： 古錢大辭典，中華書局 (A dictionary of ancient Chinese coins), 1982.